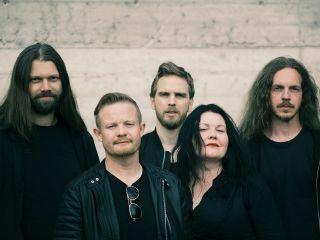 One of the most beguiling and emotionally adventurous bands to have emerged from the Norwegian metal scene, Madder Mortem may have flown slightly under the radar for the past two decades, but it’s clearly an altitude with the broadest and most spectacular of perspectives. A band whose dynamics map out a deeply personal terrain, their journey from the exquisite, doom-laden reveries of 1999 debut Mercury through to the turbulent and, well, mercurial spell-weaving of 2009’s Eight Ways, has created an immersive world with its own, intuitive set of physics and, in one-of-a-kind, velveteen-throated vocalist Agnete M Kirkevaag, a searing kernel of truth of the truth you only glimpse at the edges of rational consciousness. Now they’re back with their seventh, far-flung album, Marrow - due for release via Dark Essence Records on September 21 - that’s going unfold your heart in four dimensions, and we have a very special preview in the form of a mesmerising video for lead track, Far From Home. Created by renowned artist Costin Chiroeanu, it’s a symbol-strewn and strangely affecting animated fable, set on a fantastic world, its themes of isolation and awakening set to an anthemic, unforgettable song whose initial delicacy contains a seed for the turbulent states yet to come. “Far From Home grew out of an early morning’s vocals idea and into a very Madder song, says Agnete. “Everything we love is here: contrasts and melody, fragility and heaviness, anguish and hope. The lyrics are about a long night’s uneasy journey into day, about the gut-wrenching worry that rides on the back of truly caring for someone. Hold on tight to everything you hold dear and enter the vivid realms of Far From Home here! Visit the Madder Mortem Facebook page!